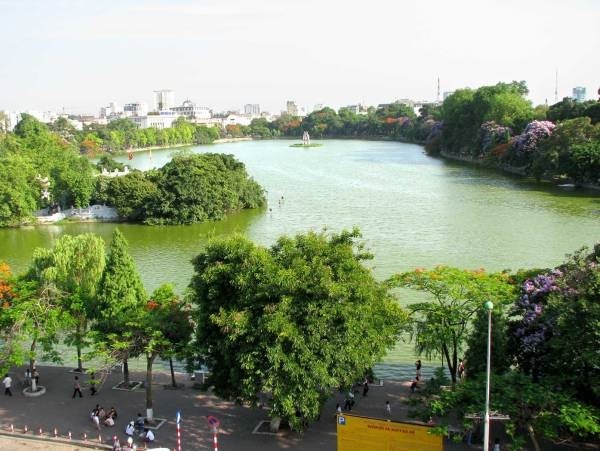 The capital city’s Hoan Kiem Lake will be dredged and cleaned by the end of July, said Vo Tien Hung, general director of Hanoi Sewerage and Drainage Company Ltd.
An aerial view of Hoan Kiem Lake in Ha Noi. The city has instructed that the cleaning project must retain the lake’s distinctive dark green colour. Speaking at a press meeting on Tuesday, Hung said the lake is severely polluted and has lost the ability to revive itself. Its water quality is getting poorer by the day, its pH level is high, and the amount of suspended deposits is higher than the permissible limit at all five monitoring locations. The company will maintain the colour of the lake during the cleaning process as requested by the city, Dung said. The project will be implemented in 120 days, starting either at the end of July or beginning of August, if approved by the two ministries.